Zuerlein with a 57-yarder in overtime to win it for the Rams, the longest gamewinner in NFL playoff history. He had four field goals on the day, including a 48-yarder to send it to OT. He'll be the second Griffon to play in the Super Bowl; Gijon Robinson started for the Colts against the Saints in SB XLIV. Bearcat Matt Longacre will also be representing the MIAA in the Super Bowl as a Ram. I need a good picture of Greg kicking in D2 for the site. I am sure that someone has a picture of Greg kicking those bombs against NW in 100 mph winds. They showed the game on the jumbotron at Arrowhead. As he lined up to kick, thought seen this before. GG Saints. The second would be perfect without that pesky holder. Just let the holder be in it! Give Adam Clausen his due! The way Griffs #31 laid waste to the bearscats must still sting. Not really, since they won the rematch 35-29. Congratulations to Greg and Matt! They are the only two reasons why I hope the Rams win. I wonder if they would let me use it. Three years at UNO and one year at MW does not make him a product of MW. It is still unbelievable that all D1 Schools missed out on him. I don't remember how heavily recruited he was coming out of HS - I know there was some interest in/from Nebraska, but they signed Alex Henery out of Omaha that year, who ended up breaking at least as many records as Z did. 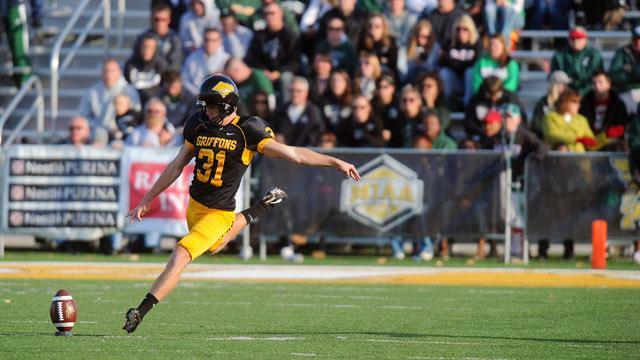 He looked into going D1 after UNO scrapped the program, but some NCAA ruling prohibited it, so he chose Missouri Western because of our kicking coach at the time, Jay White, and our indoor facility. except luis berlanga he is a true son. Depends on what side of the fence you live. All the Omaha stations were reporting him as a UNO product. No mention of mw at all. That makes sense. But the Rams' roster lists him as from Missouri Western, and that's what any national broadcast/publication mentions.